This symbolically visualizes the processing of reality, existence and truth, in order to realize,actualize and individualize principles of Moral Truth as a part of our “essence” and substance of being, living and doing. Integrating, aligning, uniting, embodying and exemplifying Moral Truth as our Path and Way in Life, to live truer, realer and higher potentials of ourselves. 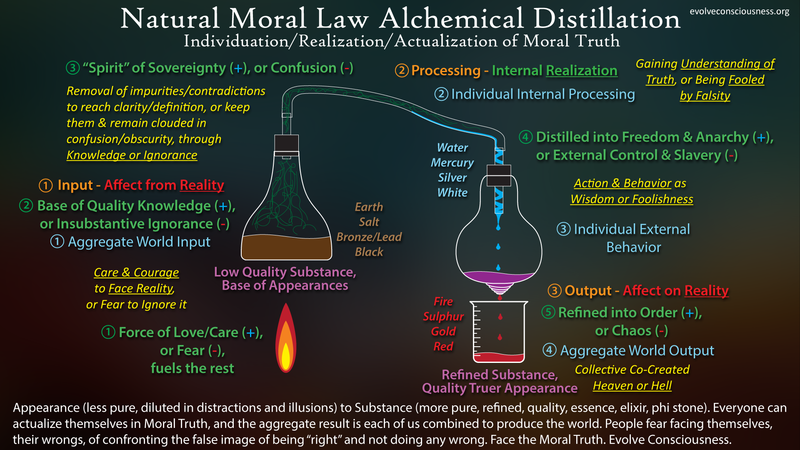 This is alchemy and alchemical distillation through moral alignment and embodiment. This is my own representation of an Alchemical Distillation Lab with respect to the individual process of developing Moral Truth/Law in ourselves. This is not the “7-step” process of “alchemy” that others describe. This is my own representation of Alchemical Lab Symbolism with the processes of Moral Truth individuation/realization, corresponded with the Trivium Methodology as well (Input-Processing-Output, Knowledge-Understanding-Wisdom). If you want to learn more about the subjects of consciousness, morality, truth, psychology and philosophy of life, I have more work on these subjects. Almost all of my work revolves around these subjects to try to elucidate and expound upon these core foundational subjects for improving our lives individually and collectively.